~~Would you like to know what I've been up to?...... I've been cheating on my beloved colored pencils, lol! Shhhhh! I know; very surprising for me. Most of you know that I usually only work in Prismacolor pencils. Lately I've just had the urge to get some paint out and play. 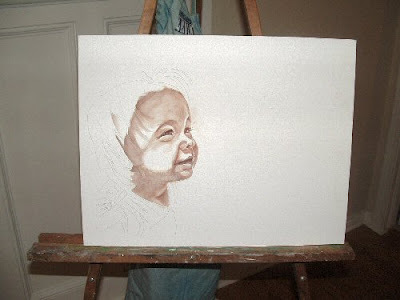 This is the beginning of a monochromatic acrylic underpainting. I'm really just trying to establish values right now. I'll add the color on top. How much I show of this will depend on how well it goes. Hmmm. We'll see. It's definitely harder to paint with kiddos around. This morning Savannah figured out how to open my paints. I caught her before she decorated the wall or herself. ~~Thank you everyone, for the anniversary congratulations. I still can't believe it's been 8 years. 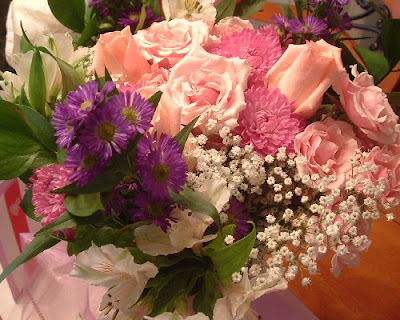 Look at these beautiful flowers my Sweetie brought home. ~~Well, I've got two hungry munchkins so I'd better get started on supper. Plus, it's very quiet which always makes me a little worried!